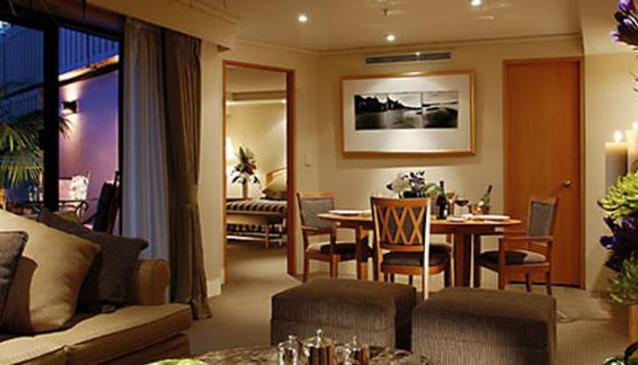 Rendezvous Hotel Auckland is 4.5 star hotel centrally located in the heart of Auckland city. The hotel has a striking lobby atrium with escalators and marble floors. Guests can enjoy 452 lavishly appointed rooms and suites, offering spectacular views of the city. The hotel has a number of quality dining establishments, immense conference facilities, and excellent fitness and leisure facilities. The hotel's luxury accommodations offer a haven to return to at the end of the day, and a perfect base from which to explore the city. The hotel is close to Queen Street and the Viaduct Harbour, and is also linked via an underground tunnel to four of Auckland's most significant venues: Aotea Centre, The Civic, Auckland Town Hall and Aotea Square. The hotel has 15 purpose-built function rooms including boardrooms, ballrooms and meeting rooms filled with with natural light and modern audio-visual equipment, The rooms are capable of hosting four person meetings up to cocktail receptions for 1,000 guests.